Ten social activists have come out in support of lawyer Prashant Bhushan in the Supreme Court, contending that the contempt proceedings initiated against him appears to be an assault on freedom of speech and expression. The activists have filed an application to intervene in the contempt plea filed by Attorney General K K Venugopal against Bhushan for his tweets in which he had said that the government appeared to have misled the top court and perhaps submitted fabricated minutes of meeting of the high-powered selection committee headed by the prime minister, in the appointment of M Nageswara Rao as interim CBI director. The activists, including Aruna Roy, Arundhati Roy and Shailesh Gandhi, have said in their application that they were "concerned" about initiation of the contempt proceeding against Bhushan for exercising his 'freedom of speech' without fear. Besides, a separate application has also been filed in the top court by five senior journalists, including former union minister Arun Shourie, seeking to intervene in the case. have said in their application that the court, while issuing notice to Bhushan on February 6 on the contempt plea, had said it would examine whether in sub-judice matters, advocates and litigants briefing the media would amount to an interference in course of administration of justice. During the hearing earlier, the bench headed by Justice Arun Mishra had said that court was not averse to media reporting of cases but lawyers appearing in sub-judice matters should restrain themselves from making public statements. The court had issued notice to Bhushan and had asked him to respond to the contempt pleas within three weeks. In their application, the 10 social activists have said, "It appears that the initiation of present contempt proceedings are an assault on the freedom of speech and expression of the citizen of this country and an attempt to stifle this right by using the power of contempt." Besides Aruna Roy, Arundhati Roy and Shailesh Gandhi, the other applicants who have sought to intervene in the matter are Wajahat Habibullah, Harsh Mander, Jayati Ghosh, Prabhat Patnaik, Indu Prakash Singh, Bezwada Wilson and Nikhil Dey. They have said Bhushan's tweets "merely pointed to the discrepancy" between publicly available letter of a member of the high powered committee and the claim of government and the tweets "in no way made any disparaging remarks against the AG (Attorney General) or his conduct". 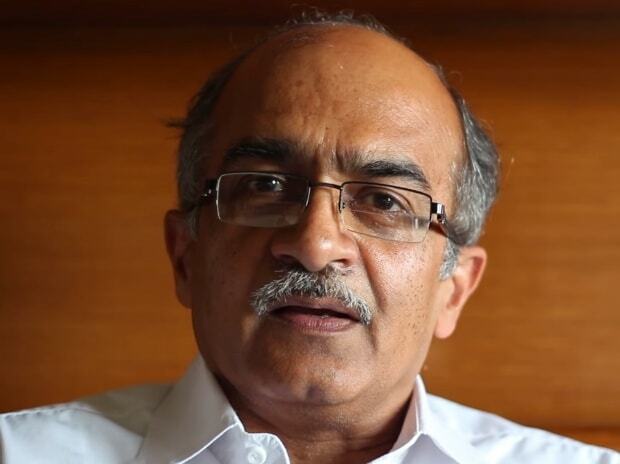 "The notice issued in this case by the court to Prashant Bhushan indicates that the court wants to deal with the larger issue of lawyers and litigants commenting publicly about pending court proceedings and whether any restraint should be put on lawyers and litigants comments on pending court proceedings," the application, filed through advocate Kamini Jaiswal, said. It said any restraint on lawyers and litigants on commenting on pending court proceedings in matters of public interest would have a "seriously deleterious impact" on not merely the freedom of speech of lawyers and litigants but also on right of people and civil society to be informed about it. In separate application seeking to intervene in the matter has been filed by Shourie and four other senior scribes -- Mrinal Pande, Paranjoy Guha Thakurta, Manoj Mitta and N Ram. They have said in their application that any restraint on lawyers and litigants from commenting on matters pending in court would also amount to restraints on media from carrying those comments and any such order by the court would have "serious consequences on the freedom of the press, its rights under Article 19(1)(a) of the Constitution and its ability to inform the people about important public interest issues pending in the courts". They have said that barring media or anybody through the media from writing or commenting about pending court proceedings would have the effect of depriving the people of information which they are entitled to know. Referring to several orders passed by the top court earlier, the application said that a consistent view has been taken and media or any other commentators cannot be barred from commenting or reporting on pending court proceedings involving matters of public interest.